We have officially entered Spring and I am currently dealing with a snowstorm here in NYC. Like I've said in a previous post, I am not letting this stop me from getting into the Spring mood. Especially with all my favorite brands blessing us with such fabulous seasonal fashions right now. One of the brands that is killing the Spring fashion game right now is Lane Bryant. I was in one of their stores over the weekend and my eyes were dancing all over the place. I was in awe at all the gorgeous things I was seeing. It's very rare for me to go in a store and find so many pieces that I love but there's a first time for everything. This inspired me showcase three looks that will have you giddy for warmer temps, whether you're looking for something for a special occasion, a fun weekend look or brunch with your girls. These looks will definitely have you all types of Spring ready. The first look that I am showcasing is definitely one for a special occasion. If you're attending a spring wedding, a graduation or you want to stunt for your birthday, this is the dress for you! This Fluted Ruffle Sheath Dress is such the show stopper with the flutter sleeves, pretty pink color and dramatic ruffle detail. The scuba fabric hugged my body in all the right places while still being extremely comfortable. To amp up the look, I added some contrast with these Striped Ankle Strap Heels, which paired so well with the dress. If you're looking for something that is going to make you stand out in a crowd, look no further. On the weekends I don't like to think too much about what I'm wearing. Comfort is my main focus and my clothes have to reflect that. My next look is for someone who is looking to be comfortable but stylish at the same time. This Cold-Shoulder Sweatshirt Dress is such a fun and flirty piece with the cold shoulder detail tie sleeve. I loved the flowy and super soft feel of the sweatshirt fabric which made for an extremely comfy dress. I added these cute Perforated Slip-On Sneakers to complete the look and I was ready to run errands, go shopping or walk the dogs all while looking stylish. My final look has to be one of my favorites because it best represents me and my style. I live for Blazers, I think they are so versatile. I love how I can wear them to work with a skirt or pants and then just change the whole look by rocking it with a tee and some jeans like I did here. The Bryant Double Breasted Blazer is not your ordinary blazer, the fit on this is phenomenal. It accentuates your shape while still having some structure, and can we talk about the gorgeous blush color?! The gold buttons on the lapel and sleeve are so chic and just make the blazer. Of course it wouldn't be one of my ensembles without some animal print. This Leopard Print Short- Sleeve Choker Tee was the perfect touch of print that the look needed. Embellishments has been poopping up on the fashion scene everywhere and is so trendy. The pearl trend is really big right now and I am totally here for it. So you can imagine my joy when I got a look at these Super Stretch Skinny Jeans with Pearl Embellishments. The super stretch jeans are some of my favorites so there was no way I wasn't going to get these. Besides the pretty pearls, I also loved the deconstructed design of these jeans that gave it a little edge. Pairing them with these Open Toe Flower Flats pull the look together for that casual chic vibe. 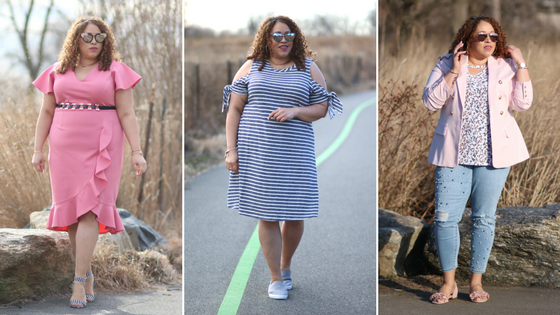 So those were my three look featuring pieces from Lane Bryant's Spring collection. Make sure to head over to their SITE to check out these things as well as all the other fabulous pieces currently available. Use the code MARGIFT for up to $75 off your purchase! Also, let me know what look was your favorite look! Thank you hun! Yea that cold shoulder dress is so cute and comfy! In the UK we heralded spring with a snowstorm as well! I love the pink dress - so chic. Ugh yea it's been a struggle here but warmer days are coming soon enough! Thanks! I love the cold shoulder sweatshirt dress! The blazer and jeans combo is really cute too! Here's hoping it warms up for you to rock these styles. Thanks hun! Yes I have my fingers crossed that we get warmer days here soon! Hey gorgeous! I can see that you were really eager to get into spring and so glad it is here. Anyway, I love your pretty pinks too much. Seems I'm really not the only one crushing for the ballet slipper pink for sure! Love all your spring inspired oubfits! That first pink dress is so pretty on you with the ruffles and gorgeous color. I love your pink ruffled dress. Looks fresh and stylish. Spring is the perfect time to dress-up more. I would be ready to step out to spring if the weather would just stay consistent. I like that bright pink dress and the third outfit with the floral shirt and pink jacket. Your choices are stunning, I totally love both the pink and the stripy dresses. Such a stylish lady. Pink looks good on you. Both the dress and that blazer are great looks. Those are really cute outfits for the Springtime. I really love the striped dress that is slightly grungy looks. Lane Byrant is one of my favorite places to go because it is one of the store that I only get stuff from.